Service Learning is an important component of a Fenn education. It strives to meaningfully incorporate Fenn’s cores values of empathy, respect, honesty, and courage through participation in a variety of community projects. Through engagement in service initiatives, Fenn students will practice civic responsibility, problem solving and leadership skills. Service Learning at Fenn also strives to connect to classroom learning and the advisory program. 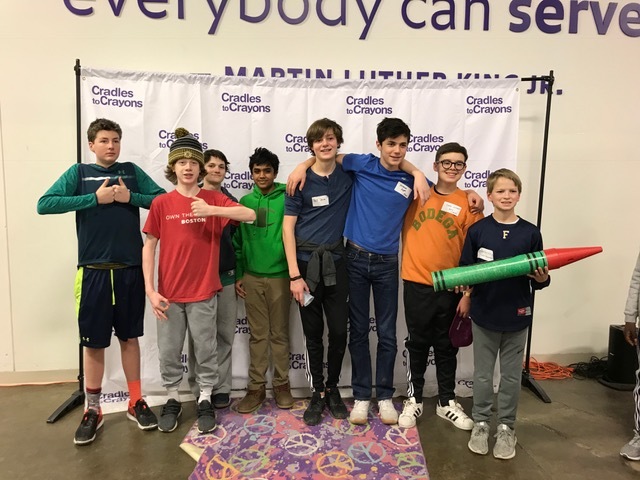 Each year, the Service Learning leadership team selects a school wide service theme, allowing students and faculty to draw connections from the projects and activities we engage in. The 2018-2019 Fenn service learning theme is Empathy and Leadership through Action. Please use the Sign-Up Genius to sign your son up for this year’s Service Learning selections. It is important to note which opportunities are for specific grades and which weekly times will not conflict with your son’s other potential activities (e.g. band, tutoring or varsity level sports). Please also note that there will be more opportunities for service learning this fall and winter that will be sent to you as an e-notify as soon as they are in place. Registration is for service learning service opportunities and will be taken on a first come basis. While there is no limit to the number of service events your son(s) can register for, we do try to allow as many students as possible to participate. This year, with Sign-Up Genius, you will receive an automated email confirming your selections when you have completed the registration process. Service rosters will also be posted on the Service Learning bulletin board in the science center at the start of school and announced at division lunches. We welcome your suggestions for future service learning projects. Throughout the year, you can continue to stay informed about Fenn Service Learning via this webpage and by following us on Twitter @fennservice. If you have any questions, ideas for future service projects, or would like to volunteer to lead a project, please email Elise Mott at emott@fenn.org or Winnie Smith, wsmith@fenn.org.